In 12-inch nonstick skillet or wok, heat oil over medium-high heat. Cook garlic in oil about 1 minute, stirring constantly and being careful that garlic doesn’t burn, until golden brown. 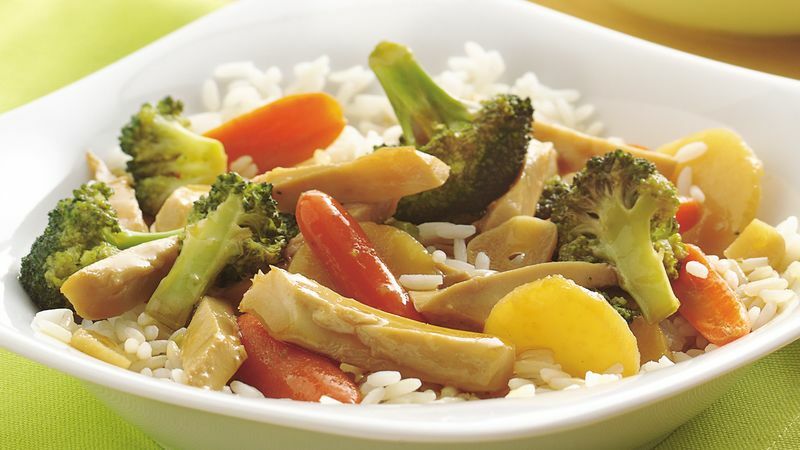 Add broccoli, carrots, water chestnuts and water to skillet. Cook 7 to 9 minutes, stirring occasionally, until vegetables are crisp-tender and water has evaporated. Gently stir in teriyaki glaze and chicken. Cook 1 to 2 minutes or until chicken is thoroughly heated. Serve over rice. If your broccoli florets are large, cut them into 1- to 1 1/2-inch pieces. Pick up a bag of already-cut broccoli florets or get broccoli at the grocery store salad bar to speed preparation.